By the time that three Confederate divisions lined up on the field of Gettysburg for an assault on the Union line, all ranks were well aware of the power of modern musketry and artillery, and the damage it could do to troops advancing over open ground without the element of surprise. Two years of bloody war had shown the high costs of such actions, yet both sides knew that while bombardments were all very well, they would sooner or later need to move infantry forward and occupy ground if they were to achieve a victory, and at Gettysburg it was the Confederate Army of General Lee that needed to keep moving forward if it was to succeed in its ultimate goal. Nevertheless there was more than one way to assault the Union line, and Lt. Gen. James Longstreet, the man given the job of conducting Lee’s frontal assault, had openly doubted that it could succeed with the resources at hand. Lee insisted however, and the costly failure that followed went down in history as Pickett’s Charge, an action that lost the Confederacy the battle, the campaign and, for many, signalled the beginning of the end for the Confederacy itself. This is the third instalment in a series of figure sets depicting this particular action, and it follows the same formula as the others, with a range of quite similar poses plus a few novelty and command figures. Set 1 had the men walking forward with muskets resting on the shoulder, and Set 2 had them advancing with rifle held up in a comfortable position, so in this set we find the men with muskets lowered and pointing directly at the enemy. As before, while these are largely variations on a theme, the results are quite mixed. The basic pose is fine, but in attempting to bring more variety into the poses the sculptor has taken some liberties, in particular with several men that have both hands at or near the lock of the musket, which is an unstable and uncomfortable way to hold such a thing. One man (middle of the third row) has his left arm with elbow very high, so does not look particularly natural. The first man in the second row is unique in that he appears to be firing his musket while on the move. Generally this was not encouraged as it did little to harm the defenders and just meant the man was in the firing zone for longer, and by pausing was losing the impetus of the advance. Again this man holds his musket in a very odd way, with both hands about the trigger, so would have great difficulty controlling his weapon. The single-piece figures begin with one holding his musket far away from his body in a pose we could not easily explain by itself. Next in our photographs are two downed men, the first is on his side and very nicely done while the second is on his back and much less convincing to our eye. The downed man still holding aloft the flag is a terrific pose both in concept and execution, and men would certainly go far to keep a flag flying even if they themselves were no longer able to stand. He could also simply be passing the flag to another, in which case perhaps the man in the row directly above him is supposed to be reaching for it, which would make a nice pair. The last full row begins with a drummer carrying his drum under his left arm and with pistol drawn, plus an officer falling back wounded and another holding sword and hat in the air. While we are happy to see drummers in poses other than just drumming, we didn’t particularly rate this one, but both the officer poses are reasonable, although we were surprised by the officer holding his pistol in his left hand. This third set in the series looks to have come from the same hand as the first two, and certainly the style and quality of sculpting seems to be the same. These are not what you would call elegant figures, and sometimes the basic proportions seem to wander somewhat. Detail is fair but no more, and much the same can be said of the general standard of sculpting, with fairly basic faces and some hands that are very poor indeed. The sculptor has made an effort to show clothing with tears and patches, which is a nice idea but very tough to do well at this scale, but items of kit are very simply done here. The seam round each figure has a slightly rough finish to it, but that apart there is very little flash worthy of the name. 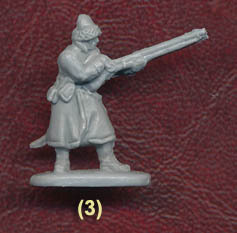 However some of the poses do have a noticeable amount of plastic in areas where the mould cannot reach, particularly on the man firing his musket. Although Confederate infantry could be much smarter in appearance than is commonly assumed today, these men have a very mixed and un-uniform appearance, with coats of all sorts and a range of brimmed hats as well as a few peaked fatigue caps. The officers naturally do better, with regulation frock coats and a sword hanging from a belt over a sash, but the general appearance is scruffy, which is probably what most customers want and is not wrong, although exactly how smart or otherwise the men who participated in Pickett’s charge itself were is unclear. The men’s kit is varied but minimal (nice to see some rolled blankets round the bodies), and their weapons, although poorly defined, all have the three barrel bands that suggest the common Springfield or Enfield models, amongst others. The only apparent accuracy problem is with the drum, which has none of the tension ropes such an instrument would need, but has been given a diagonal pattern round the sides for no apparent reason. The flag being held up is 13mm square, so about 94cm in real life. This is too small to be a main battle flag, which is what you would expect the men of Pickett’s Charge to be carrying into battle, but could serve for others. The many quite awkward poses and the relatively weak sculpting are what let this set down, although we liked some of the one-off poses a lot. Compared to other sets of Confederates this is not a strong offering, but if individual beauty is not what you are looking for in your figures then this collection will furnish lines of Civil War troops moving forward along with some interesting and very useful special figures that will go far to depict the chaotic scene once the advance began to falter.